Join our Master Mixologist at the bar at Elm City Social in New Haven for classes on craft beer, beer cocktails, pre-prohibition (classic) cocktails, and basic bar technique. Classes are $55 per person, last 1-2 hours and typically run Friday-Sunday in the afternoons. At the end, you’ll enjoy some of our delicious food to pair with cocktails you’ve learned about! Contact us today at (475) 441-7436 to book your class! We offer classes in the restaurant that teach you about craft beer, the ingredients, how it’s made, you’ll learn about different styles and how the ingredients and process changes the finished product. We’ll also teach you how to use beer to make cocktails as well. We offer classes in the restaurant that teach you about pre-prohibition era classic cocktails. From the ingredients, to the techniques, these classes provide a strong foundation to your cocktail knowledge. You’ll know the story behind some classic cocktails and their origins by the end of the class. We offer classes in the restaurant that teach you some of the basic tools and techniques to build your favorite cocktails. 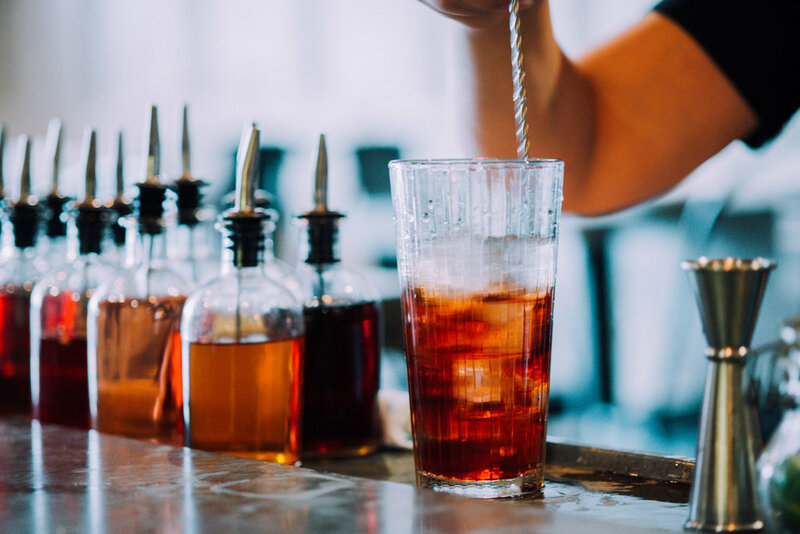 After this class you’ll know when to shake, when to stir, when to strain, what glassware to use and why, plus many other tidbits to up your home bartending game or just to impress friends. We offer classes in the restaurant that teach you about whiskey; from how its distilled, to the types of whiskeys and how to tell them apart, to making a few whiskey based cocktails. By the time your class is over you’ll have a better appreciation and some new knowledge about this popular and intricate spirit. We’ll also make sure to sample some food that pairs great with the spirits and cocktails you’ll taste throughout the class.